Enjoy a free evening of art, music and entertainment as Pasadena’s most prominent arts and cultural institutions swing open their doors. Last fall, more than 16,000 people experienced the excitement of ArtNight. Experience the collision of image, fashion, body sculpture, and costume in GARB, a multi-disciplinary exhibition of contemporary art and design exhibition! (M) Behold rare classic and contemporary automobiles that have contributed to the evolution of aerodynamic design, in Details of Design: Beauty, Aerodynamics and Functionalism. (H) Get the lowdown on highly evolved design, at Mike/Sierra/Tango, an exhibition about the beauty and complexities of Multi-Script Typefaces. artWORKS teens display their talents through live performances and visual arts. Come for an interactive evening that includes hands-on, family-friendly arts workshops alongside musical entertainment. Explore the rich tradition of the California Impressionist movement. View the special exhibit of representational artwork, meet exhibiting artists, and watch them create new works. Admire the timeless art of photographer Alfred Haymond, browse through the unique Jackie Robinson exhibits and revel in the musical sounds of the JazzZone ensemble. Discover the best of Kidspace and enjoy the marvels and wonders that bring art together with nature and science. MUSE/IQUE @ ARTNIGHT is going Under the Sea for a night of live music, dancing, crafts, bubbles, and more! Bring your whole family to our free event kicking off our Summer of MOVING/PICTURES. View the exhibitions Titian’s Lady in White from the Gemäldegalerie Alte Meister in Dresden, Once Upon a Tapestry: Woven Tales of Helen and Dido and Matisse / Odalisque. Wild, Wild West Yeehaw! It’s a Western Shindig featuring music, dance, shows, and art honoring Pasadena’s 2019 One City, One Story selection, In the Distance by Hernan Diaz. No Boundaries 14 showcases the artistic talents of PUSD students from K to 12th grade. Hundreds of artworks are on view, accompanied by lively student performances. Installed and curated by Rose City HS students and Side Street Projects. Celebrate RHP’s 25th anniversary! Watch a book grow from seed to flower, fight crime with our fitness superhero, attend an eco-friendly cooking demo, and get FREE books! Enjoy traditional Japanese taiko drumming by Makoto Taiko at 6:15, 7:15, 8:15, and 9:15 p.m., free taiko workshops, and designing your own onigiri (rice ball). Some of LA County's favorite food trucks are coming to ArtNight. As part of the GiveBack Program, these food trucks will donate 10% of their ArtNight proceeds to help support future ArtNights. Pasadena Transit 10 runs along Colorado Boulevard and Green Street until 8 p.m. Information at pasadenatransit.net. 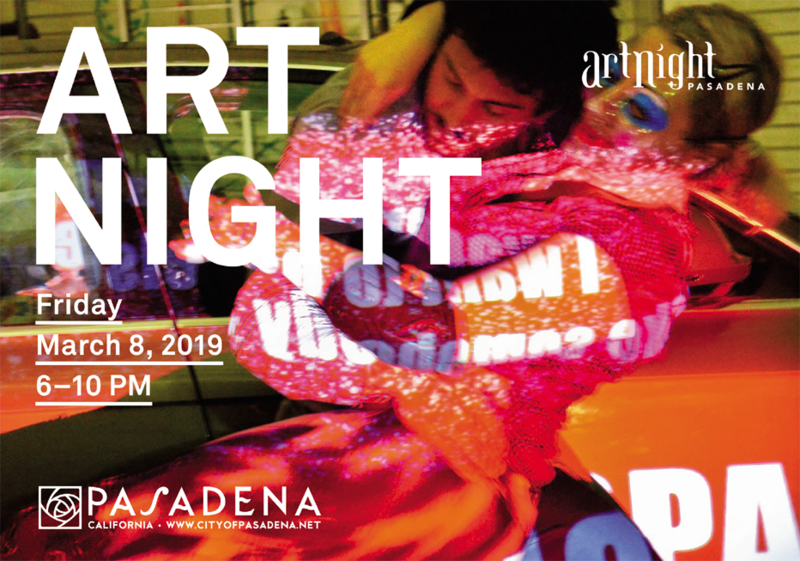 Click HERE to download the full ArtNight Pasadena Brochure. For information on accessibility and/or to request written materials in alternative formats, please call the City of Pasadena at (626) 744-7062. Go Metro and take the Gold Line to Memorial Park Station and walk one block to the shuttle at City Hall or the Armory! Receive some pretty cool stuff when you show your valid TAP card, Metro employee ID, or LA County employee ID at select ArtNight sites. Metro bus and rail transportation to Pasadena runs until 2am. Visit the Metro Trip Planner or call (323) 466-3876. Follow @metrolosangeles on Twitter and Instagram! #GoMetro. Special ArtNight Metro destination discounts HERE!